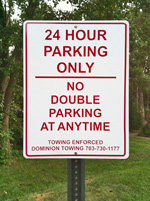 Call Dominion Towing at 703-730-1177. IMPORTANT: Cul-de-sac at the end of Greenberry Lane is for parking by guests only and limited to 24 hours! Beginning August 7, 2015, a Visitor Parking Permit is required in order to park in the Cul-de-sac. To obtain a Visitor Parking Permit, contact EHCA Board members at 571-239-8014 or at 703-642-8954. Vehicles must be parked all the way to the curb because the cul-de-sac is intended to be used for the turnaround of large and emergency vehicles. If your vehicle is not parked against the curb or extends past the white lines, it will be subject to towing. Whereas, Article II, Section 15 of the Covenants, Conditions and Restrictions (“Covenants”) for Evergreen Heights provides that no truck, bus, or commercial vehicle of any kind shall be permitted to be kept or parked overnight upon any portion of the Property. Whereas, the Board of Directors believes it to be in the best interest of the Association and its members to reserve two parking spaces for the exclusive use of owners and to establish and implement regulations and procedures addressing parking of vehicles by members of the Association and their guests. a. All vehicles must conform to Fairfax County and Commonwealth of Virginia codes, ordinances, and statutes. All vehicles parked on the Property must bear current licenses, registrations and certifications as required by Fairfax County and/or the Commonwealth of Virginia or other applicable jurisdictions. b. No vehicle shall be parked in such a manner that the vehicle extends beyond the limits of the parking space. Parking space lines extend 18 feet from the curb; therefore no vehicle shall be longer than 18 feet. c. No junk or derelict vehicle shall be parked on the Property at any time. All vehicles must be kept in good operating condition at all times so as not to be a hazard or nuisance by noise, exhaust emission, appearance or otherwise. For the purpose of this Resolution, good operating condition shall mean that all parts of the vehicles such as tires, wheels, engine, brakes, windows, top, lights, exhaust systems, bumpers, etc. shall be maintained in working order al all times. Vehicles that leak any fluid other than water condensation from the air conditioner shall not be parked on the property until it is repaired. Any vehicle in violation hereof shall be deemed junk, derelict, or a nuisance. d. Only “private” vehicles may be parked in parking spaces. “Private vehicles” excludes junk vehicles inoperative vehicles, abandoned vehicles, trailers, semi-trailers, recreational vehicles (as defined below) and commercial vehicles (as defined below), all of which are prohibited in the parking spaces. “Inoperative” means any motor vehicles, trailer, or semi-trailer that is not in operating condition, or which for a period of three days or longer has been partially or totally disassembled by the removal of tires and wheels, the engine or other essential parts required for operation of the vehicle. An abandoned vehicle also is one that does not bear a current license plate, current valid state inspection certificate, and/or current Fairfax County decal. No “private vehicles” shall be loud, noisy, or annoying. e. Motorcycles or any two-wheeled vehicles shall only be parked in front of the owners reserved space parallel to the curb face (perpendicular to parallel spaces). f. No commercial vehicle of any kind (i.e. truck, pick-up truck with a tool box, van, taxicab, bus, etc) may be parked in any location within the bounds of Evergreen Heights, including paved and unpaved common areas, without the prior approval of the Board of Directors. A commercial vehicle is a vehicle which bears any commercial advertising signs, names, logos, dealer tags, letterings or initials; or any vehicle used, or obviously intended for use, as a car for hire, or a work vehicle, which may be evidenced by open carriage of pipes, lumber or other materials or ladders, tools, or other equipment. A commercial vehicle is a vehicle designed to transport sixteen or more passengers including the driver. A commercial vehicle is also any size and is used in the transportation of hazardous materials regardless of whether or not the vehicle is used in a commercial profit-making activity. Any commercial vehicle, which has been contracted to enter the community to affect repairs or provide other services, may park in any appropriate non-reserved space on the common areas during normal daytime business hours of 7:00 a.m. to 6:00 p.m. unless an emergency situation warrants parking in a non-reserved space during other hours. g. Owners of lots whose residents and/or guests violate this policy shall be held liable for any damages to the Association caused directly or indirectly by the violation, including the cost of enforcement, which shall include reasonable attorney’s fees, and legal costs. h. Residents may call the EHCA designated towing company if a car is parked in their reserved space. The resident requesting the tow will be responsible for paying any fees incurred if space is vacated before truck arrives. i. No vehicle other than a “private vehicle” may be parked on the Property. After ten days written notice to the owner of any vehicle parked in violation of this provision, the Association may remove such vehicle at the expense of the owner of the vehicle. a. Vehicles shall be parked in designated parking spaces only. b. No vehicle shall be parked in a fire lane or no parking area as designated by a yellow curb. c. No vehicle shall be double parked or “stacked” behind an assigned parking space or parked in the street so as to extend in front of any driveway area or parked in a driveway so as to extend into any sidewalk area. d. No vehicle shall be parked in such as manner as to occupy more than one parking space, or so as to extend beyond a parking space, or so as to block any vehicle parked in conformance with this Resolution, or so as to prevent ingress or egress of any other vehicle to adjacent parking spaces of the open roadway. e. Storage of vehicles of any type in a parking space or parking area or on any other park of the property is strictly prohibited. f. No portion of the Property shall be used for maintenance or repair of an automobile. After ten days written notice to the owner of any vehicle parked in violation of this provision the Association may remove such vehicle at the expense of the owner of the vehicle. b. Any vehicle which is parked so as to block another vehicle, or so as to block a sidewalk, or is double parked or “stacked” behind an assigned parking space or parked in the street in front of any driveway, or so as to prevent ingress or egress from or to an adjacent parking space or parking areas, or any vehicle that occupies more than one space or extends into the open roadway may be subject to immediate towing. c. Any vehicle parked in a “no parking area” as designated by a sign or yellow curb or a designated fire lane may be subject to ticketing and/or immediate towing. Any truck, bus or commercial vehicle shall also be subject to immediate towing without notice to the vehicle owner. d. Any vehicles deemed to be junk, derelict or a nuisance shall be subject to towing three days from the date the vehicle is served with a warning notice for the first offense, and shall be subject to immediate towing without notice for any second offense of the same type. e. Except for the above stated regulations where a vehicle is subject to immediate towing and except for any instance in which a vehicle is parked so as to create a health or safety hazard, the association shall issue a warning notice to any vehicle which is in violation of this Resolution before initiating a towing. The warning notice shall be placed on the vehicle and a copy retained for the records of the Association. Vehicles tagged with such warning notice shall be subject to the towing provisions of this Resolution at the owner’s risk and expense upon the expiration of the time period designated in the warning notice except that any vehicle previously service with such warning notice for such violation of any part of this Resolution shall be subject to immediate towing without the warning notice for a repetition of the same violation. f. The Board may authorize towing by a towing company under contract with the Association of vehicles with expired tags, expired state of county stickers, abandoned or disabled vehicles, commercial vehicles, and other vehicles in violation of this parking resolution. g. All towing will be at the risk and expense of the vehicle owner. Furthermore, the vehicle owner shall bear full and complete responsibility for the towing enforcement and shall agree to hold the Association, it’s officers, directors, members, and agents harmless from any and all liability, cost, or fees that may incur in defending themselves for any enforcement actions undertaken which were not directly authorized by the Board of Directors or its designee. h. Owners must comply with this policy and inform their guests, tenants, and other invitees of this Parking Resolution. Similarly, owners should report violations of the policy to either the designee of the Board of Directors or the Fairfax county Police Department, as appropriate. i. Invalidation of any of these paragraphs or sections by judgment or court order shall in no way affect any other provisions, which shall remain in full force and effect. Nothing in this Resolution shall be construed to hold the Association, the Board of Directors, any Committees, or any agent of the Association responsible for damage to vehicles or loss of property from vehicles parked in designated parking spaces or parking areas or towed from the Property. Owners of vehicles which cause damage to the common area shall be held liable for such damage, including the payment of any and all costs of repair to the common areas, for pavement, curbs, gutters, signs, landscaping, etc.